How Old Is that Mini, Really? The most distinguishing feature of all 1959-’67 models was the use of sliding side windows for the front passengers. These windows slide fore and aft, and the doors themselves feature external, visible door hinges. The very first cars were supplied with the bulletproof (but underpowered) 848cc engine. The first models to be identified as the performancetuned Mini Coopers were introduced in 1961 and received more powerful engines and other upgrades, including disc brakes up front—7-inch rotors on the Cooper and 7.5-inch rotors on the Cooper S. Whether it is a Cooper or standard-issue car, all 1959-’67 Minis came with 10-inch-diameter wheels. From the car’s introduction up until the end of the 1967 model year, about 15,000 Minis were imported for U.S. customers. After that, well, things get a little confusing. One could easily argue that if today’s American Mini enthusiasts were only limited to the cars originally imported to the U.S., then it would be too easy. However, the current appetite for a classic Mini here in the States has pushed the market way beyond those cars that were imported by the factory. At this date and time, it is easy to admit that more Minis have been imported into the U.S. by individuals and private dealers than were ever shipped here by the factory. The problem comes in properly identifying a Mini, as many of these unofficially imported cars have had their year of manufacture altered to comply with U.S. Customs, DOT standards and EPA laws. In other words, that car being sold as a 1966 Mini may have really been built as recently as 2000. Not only are swapping VIN plates and fudging paperwork illegal, but not knowing the year a car was built also makes ordering replacement parts a tricky task. The problems started in 1968, when the factory no longer attempted to have the Mini in any configuration conform to U.S. emission or safety standards. These days, however, federal law allows cars that are at least 25 years old to be imported into the U.S. without concern for these standards. As a result, the next pool of “legal to import” Minis includes those produced from 1968 through 1981. These models start with the Mk II car, which was produced with 848, 998 and 1275cc engines. By late 1969, the model now known as the Mk III was released. The big changes were roll-up windows and doors with internal door hinges. By 1973, the electrical system was upgraded, with an alternator replacing the generator. The gear-change mechanism was also changed, as the rod-change transmission replaced the “magic wand” gear stick found in many of the earlier cars. In 1976, the car was further upgraded to the Mk IV. The most significant change was not very visible, since it was an attempt to isolate the car from road noise and as such involved using rubber mounts for the front subframe. The Verto clutch became standard for 1980 in another change that was not outwardly obvious, but was still significant. The Mk V Mini was released during 1984; the biggest update it offered was the standardization of 12-inch wheels and 8.4-inch front disc brakes. The various changes made after the Mk V debut seemed to come fast and furious, and many consider the 1991 Minis to be the first year of the Mk VI cars. The Mk VI models are distinguished by the use of the 1275cc as the base engine, as the 998cc engine was dropped. The single SU carburetor finally went away in 1994, replaced by single-point fuel injection. The single-point injection continued through 1996 and was replaced by a multipoint setup that was standard until the car’s end in 2000. Along with the multipoint injection, the Mini started to receive an alarm system and a catalytic converter during the mid-1990s. So What Year Is My Mini? 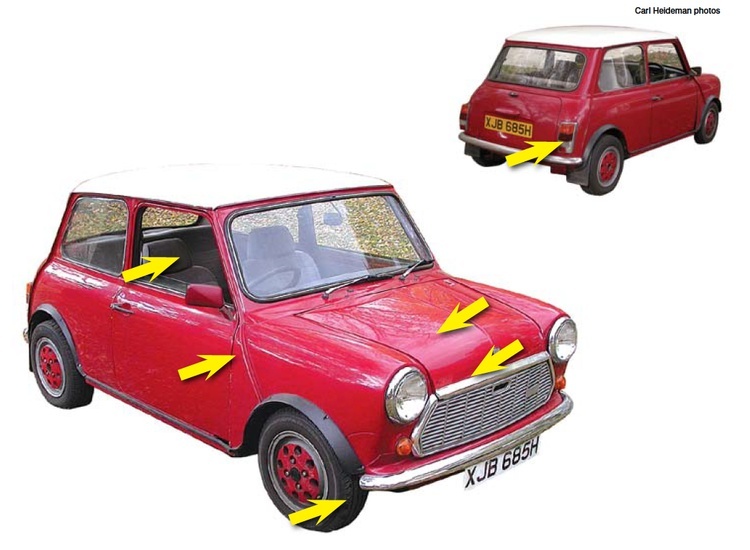 Since so many of the Minis found in the States have been assigned new VIN plates, body shells and paperwork, determining the actual year of production can be an archeological exercise. If a car is being sold as an early model, yet has 12-inch wheels, wind-up windows, fuel injection and other characteristics of the later cars, some warning bells should start sounding. 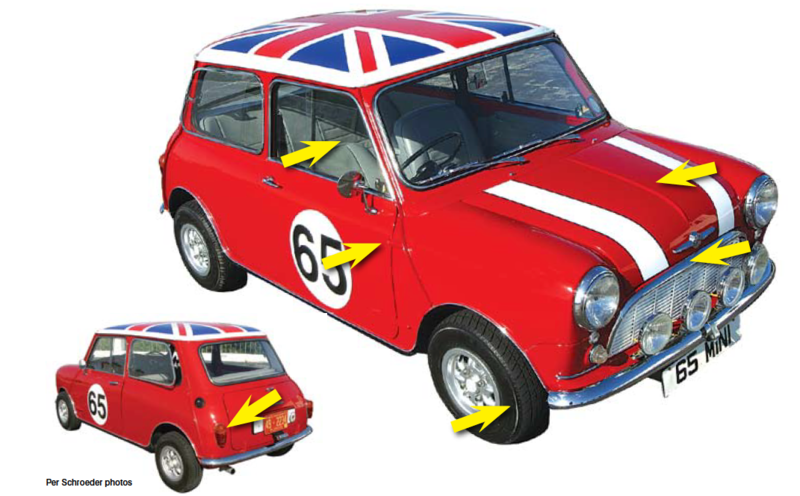 Determining the Mark of a classic Mini should at least narrow down approximately when the car was built, while the hundreds of small changes carried out during the model’s production run can usually fine-tune the birth date to an actual year. An extensive and interactive pictorial that can help with that exercise can be found online at minimania.com/MiniID.